One of the best hostels I've ever stayed in! Clean and nice room, the staff is helpful, so everything was perfect! 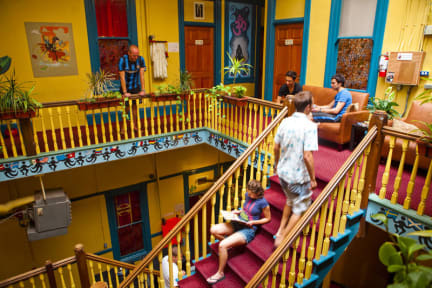 Awesome hostel in a great location, walking distance to bars, restaurants, and entertainment. They also provided a lot of activities if you're looking for something to do and the lounge was very social but separate enough from most of the rooms that it wasn't loud. Great location, friendly staff and clean accommodations. I love the atmosphere of the hostel, everyone’s always willing to help and there are lots of things to do. They have shuttles taking guests to the beach 3 times a week and everyday there’s something going on in the evenings. Cool place. Really recommend it. Awesome staff, fun events planned every day. Breakfast is great. Quiet at night. 6 person room spacious. Great place to stay, staff were friendly, place was very clean. My only concern would be how hot it gets in summer. Rooms don’t have any windows, and on the day it was 26 degrees celcius which isn’t that hot, I really struggled to sleep because it was so stuffy. Great location in the heart of town and very friendly and helpful staff. There are some gross smells lingering around, mainly in the entrance stairs and in the water coming out the bathroom taps and one of the showers, so that may need some looking into. It was clean and the staff was nice. There was some weird guy sleeping on the couch all day/night in the lounge. When I told him I needed to use the lounge to work for a few hours and I'd be talking on the phone, he got all mad about it. Not sure if he paid for a bed or not but really annoying to have someone bogarting the lounge all the time. I wasn't a huge fan of downtown San Diego. I felt downtown was overpriced and no cool places but for someone who wants to stay in downtown,be good.